Vitamins are found in nearly all foods, so as long as you are eating a reasonably healthy and balanced diet it is unlikely that you or your baby will suffer vitamin deficiency. If you do need to supplement vitamins needed during pregnancy make sure you do so with the advice of your doctor and do not take any in excess as this can pose a risk to baby. Folic acid is one of the most important vitamins needed during pregnancy. Your body’s need for it doubles while you’re pregnant. Since your body does not store this vitamin, and as the kidneys excrete much more of this vitamin during pregnancy, you need a daily source of 400-800 micrograms. Deficiency in folic acid has been linked to congenital malformations of the baby’s central nervous system, primarily spinabifida. Recent studies showed that pregnant women who took between 100 and 4,000 micrograms of folic acid during the first 6 to 12 weeks of pregnancy had a much lower risk of delivering babies with spinal column defects. Since there is no way to tell if you are one of these women, all women should take folic acid supplements as early in pregnancy as possible since these malformations occur in the first few weeks. Folic acid is plentiful in common foods, such as raw, leafy vegetables, legumes, kidneys, nuts, liver, dark yellow fruits and vegetables, dried beans and peas, and broccoli. Don’t megadose on vitamins needed during pregnancy unless your doctor orders you to. Excesses of vitamin A, D and E have been linked to birth defects or health problems in the mother. Even though the body usually protects against overdosing of most nutrients (especially water-soluble vitamins), excess vitamins A, D and E are not automatically eliminated from the body because they are fat-soluble and therefore stored in body fat. 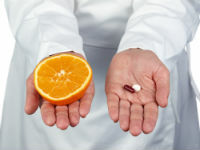 Large doses of vitamins A, C and B-complex used to be considered harmless because these vitamins are water-soluble and therefore the excess is easily excreted through the urine. Yet newborns of mothers who take megadoses of vitamin C can enter the world dependent on these high doses and actually develop signs of vitamin deficiency after birth. Some infants of mothers who took large doses of vitamin B6 during pregnancy may be more likely to develop seizures. The bottom line on this new research on vitamins needed during pregnancy is that it’s safest to stick with the dosage of vitamins recommended by your healthcare provider, no more, no less.